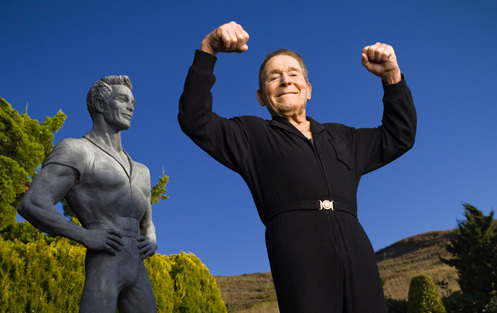 Just heard of the passing of Jack Lalanne, the father of physical fitness. He was my idol growing up, (shows you how old I am:) he knew how to live life to the fullest right up to the termination point. I particularly remember the amazing physical stunts he did back in the seventies and eighties: He would swim a mile towing sixty row boats with passengers, and one time he swam the length of the golden gate bridge underwater, and handcuffed! Incredible. I can still hear you pumping iron somewhere, Jack. We’ll never forget ya, you were an inspiration to all of us.